We are always fascinated by the practical arrangements of international events and institutions. 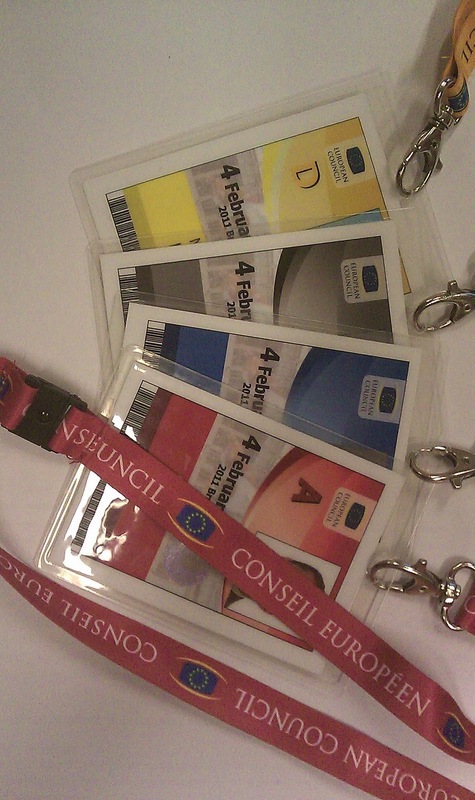 European Councils are probably the most interesting, so we can’t resist a quick post. More details upcoming over the WE. First of all normal access badges don’t work on these days. All participants are issued special badges for the event. For reasons of security and organization, access to different floors of the Justus Lipsius building are restricted to certain groups of people. The higher the floor, the more exclusive it is, in general. That’s all marked by colour codes: yellow (press area and briefing rooms), grey (+delegation rooms), blue (+presidency room), red (+ meeting room area), gold (+80th floor where the VIP lunch takes place). Journalists get yellow badges. 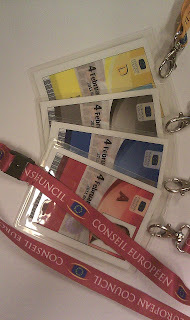 Member State delegations are allocated a very limited number of nominative badges for each colour code + some grey, blue and red floaters, which allow you to jump up one colour code (like a special temporary power up card – until you have to pass it on to a colleague who has better reasons to get access). The colour of your badge defines your position within the diplomatic hierarchy – many diplomats collect badges of past European councils as a kind of „status symbol”. For details on food and other arrangements, see our upcoming post over the week-end.